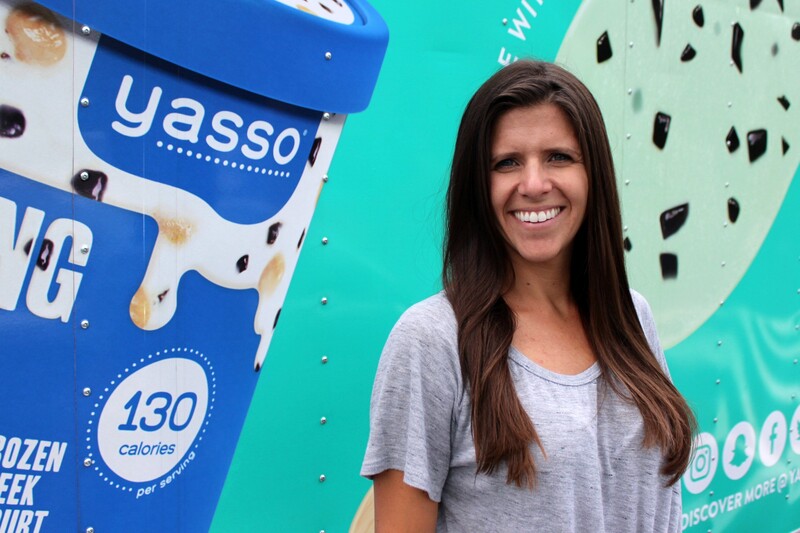 I had the pleasure of interviewing Amanda Klane, Co-Founder and Co-CEO of Yasso, Inc. Alongside her best friend and kindergarten classmate Drew Harrington, they launched the first frozen Greek yogurt offering in 2011 and have become one of the fastest growing frozen brands in the category, offering 16 stick bar flavors and 8 pints with some exciting innovation on the horizon. 2018 also marks the launch of their non-profit initiative, the Game On! Foundation. Drew and I met in the kindergarten classroom in Easton, MA. We remained childhood best friends and stayed close when we went off to college to pursue Division 1 sports scholarships — Drew ran track at American University and I played soccer at Providence College where I earned my Business Management degree. At 23-years-old, I decided to leave the comfort of my first job out of college in the food brokerage industry to team up with Drew in the venture of starting the first frozen Greek yogurt brand. To say the least, people thought we were nuts, but we knew it was a challenge we had to take on! We were both athletes who always had a love for quality food brands and a passion for dessert — especially our go-to guilty pleasure — ice cream! At the time, we couldn’t find an offering on the market that provided the best of both worlds: a flavor-packed indulgence that tasted good but also met our nutritional benchmarks made with better-for-you ingredients. We saw that gap in the market and knew there were others like us craving a solution. When we headed off to Penn State’s Ice Cream Camp in 2009 to find a way to freeze Greek yogurt, we faced more than a reasonable amount of doubt from our fellow ice cream campers, but we didn’t give up. We took our passion and found a way to make it happen tackling our fair share of challenges along the way. While Greek yogurt was booming in the refrigerated set, no one had thought to freeze it and create an ice-cream like dessert that still packed the nutritional benefits consumers loved about Greek yogurt in the first place. Out of the all the aisles in the grocery store we probably picked the toughest one to be David in a sea of Goliath’s. At a young age we went up against deep-pocked, legacy brand competitors who had dominated the shelf space for a long time but weren’t innovating to meet the current consumer needs. You had your uber-indulgent high calorie offerings on one end of the spectrum and your poor tasting diet brands filled with artificial sweeteners on the other. The opportunity was ripe for us to shake things up. As the first of its kind, we came out of the gate with strong initial success and continue to grow at a faster rate than our top ten competitors, having experienced another year of double-digit growth in a category rooted in established brands. We started out offering novelty stick bars and this year launched a line of pints that are some of our best tasting flavors like Party Animal, a birthday cake base with real chunks of cake and sprinkles and Caramel Pretzelmania which is filled with caramel swirl and chocolate covered pretzels. You’d be hard-pressed to find another brand in the space offering our level of indulgence with sensible nutrition that really tastes like dessert and that’s a key point of difference for us. My father has been a key mentor for me, having run a successful food brokerage for most of his life. Drew and I were also fortunate enough to surround ourselves with really smart, talented team members and financial partners who have help support and grow our business in tremendous ways. It’s such an exciting time to be in this category. Given our athletic backgrounds, Drew and I are competitive by nature and welcome the challenges brought on by some of the newcomers in the space, along with the never- ending grind of fighting for more space in the limited freezer doors. But the sky is really the limit for Yasso. 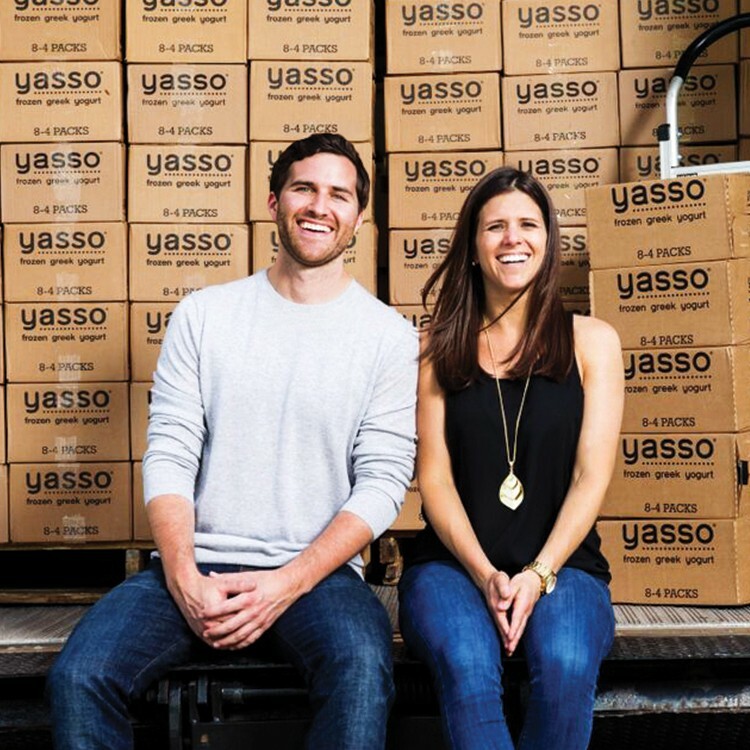 We’ve developed and continue to grow a passionate, loyal and valuable group of brand fans and Yasso consumers and we plan to continue challenging the status quo and creating delicious desserts that people can enjoy daily. We have some exciting limited-edition launches coming up later this year and a robust innovation pipeline for 2019 we’re pumped about! Hire people that are smarter than you — You’re never going to know the answer to everything, so surround yourself with a team of people who are experts in what they do. We had no idea how to create and manufacture frozen Greek yogurt when we started (even after a trip to Ice Cream Camp) so we found people who were experts in dairy science and manufacturing and that’s how we got our initial products made and scaled. Prioritize the important things — A lot of different things will get sent your way on a daily basis so being able to take a step back and ensure you are focusing on the tasks/projects that will progress the business is important. Money is King — In order to drive the business forward you need to have money in the business to be able to re-invest. I wish someone had told us before our first fundraise to take on more money, because it saves a ton of time and energy to not have to go back to the market and allows you to keep driving the business rather than spending time in the fundraising process. Both are business focused podcasts where I hear about other brands and companies and their struggles and successes. I find it incredibly valuable for all entrepreneurs to learn from others both in and outside of their industry and shows like this provide a much more intimate story. I’d have to say Jeff Bezos. I don’t know if there’s anyone who’d pass up that meeting! Like many I’m fascinated by Amazon’s success.